Hotel Caribbean Coconut is at the edge of the jungle and you experience wildlife at your door. Sit on the patio at dusk or dawn and wait for wildlife to find you. The serenade of frogs, chorus of colourful birds, the ‘howls’ of howler monkeys, a slow moving sloth and a boa constrictor wound around a branch of a tree are all part of the beautiful scenery surrounding the hotel. It has a beach across the road with an untouched coastline. Paradise! It is a small hotel with excellent maintenance and family service, which makes you think and feel you are at home. The owners give a lot of personal attention to the guests to ensure that they experience the thrill of the Caribbean, its cuisine and warmth and take the memory back as a treasure. This is one of the newest hotel with rooms built in wood to give the tropical image, and equipped with air conditioners, Wi-Fi, bathrooms with hot and cold water, private patios, and a welcoming swimming pool. The hotel is the perfect place to unwind after a hike in the jungle or the beach. The gorgeous beach goes on for miles and it is pretty desolate, so a stroll in the afternoon is very relaxing with the warm sea breeze caressing you. Safety and security is part of the package though you are living in the jungle! Back at the hotel, each room is provided with free breakfast and you are welcome to bring your pet as well. Extras include bed linen. Service is available for 24hours at the front desk and parking is free. The Italian restaurant run by the owners serve authentic Italian cuisine, prepared by the family and only fresh Italian products are used. Pasta, pizza, meat, fish, fruits, desserts, drinks are all at its best, since they rely on quality. They cater to special menus as well and take out is also an option. The restaurant is open daily from 6 p.m.
Groceries are nearby so it is very convenient. The rooms have a safe. The photos on the website give the impression that the hotel is on the beach, but it is not. The rooms face the courtyard so the view of the beach is blocked. But you have the option of turning your chair to get a view of the ocean. When it rains, the beach path gets soggy and swampy and you may have to look for an alternative route. If you don’t have a car, you have to rent a bike. Some parts of the beach is littered with driftwood but the farther you walk, it gets to be pristine. Love this? Explore the entire list of places to visit in Cahuita before you plan your trip. Fancy a good night's sleep after a tiring day? 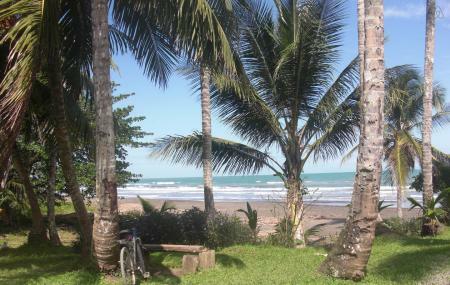 Check out where to stay in Cahuita and book an accommodation of your choice. How popular is Caribbean Coconut? People normally club together Pizzeria Cahuita and Alma Verde while planning their visit to Caribbean Coconut. The owners are wonderful hosts. Melida is so nice and works hard to make sure that everything is to your satisfaction. Clean beautiful rooms, amazing grounds (the flowers and bushes are filled with birds, hummingbirds and all sorts of small lizards), enjoy delicious homemade meals while looking at and listening to the waves. All this only a short walk from the beautiful Caribbean. Paradise. Great place and location. The hostess, Mely, is fantastic! Highly recommend it! Came in late. We were unannounced and greeted with open arms. Beautiful, clean and Ashley did a great job on breakfast. Only spent one night because we were trying to see as much of Costa Rica as possible in a week. Would definitely return. This hotel has been a very good experience every time we are here. Very well maintained and exceptional attention to service for their guest's needs.